Answer (a). X and Y are mid points of AB and BC respectively. As per mid-point theorem XY = BC/2 or 6 cm. 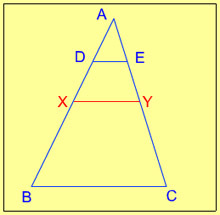 Similarly, in triangle AXY, D and E are mid-points of AX and AY respectively. Therefore, as per mid-point theorem DE = XY/2 = 3 cm. Area = 6 x 16 = 96 sq. cm. 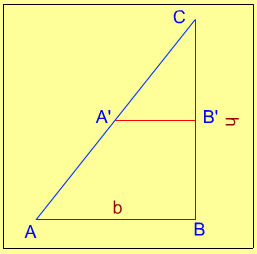 The ratio of area of triangle CA'B' to ABC = 1 : 4. Therefore, the ratio of area of quadrilateral AA'BB' to the area of triangle ABC = 3 : 4. Since CD = AC, triangle ADC is an isosceles triangle. Therefore angles CAD and CDA are both equal to 72o/2 = 36o. 6. Side BC of triangle ABC is produced to D. If angle ACD = 140o and angle ABC = 3 ⁄BAC, then find angle A. Answer (c). Exterior angle is equal to the sum of 2 opposite interior angles. Answer (b).Note: A line joining the mid-points of any two sides is parallel to the third side. Answer (a). The circumcentre of a right angled triangle is the mid-point of the hypotenuse. 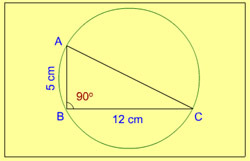 AC = 13 cm which is also the diameter of circumcircle. Therefore the radius of the circumcircle = 6.5 cm. Answer (b). In an equilateral triangle, centroid and the circumcenter coincide. 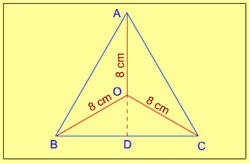 AD is thus the height as well as the median of the triangle. Since the centroid divides the median in the ratio 2 : 1, the height of the triangle will be 12 cm. Property: Ratio of areas of two similar triangles is equal to the ratio of squares of the corresponding sides. 13. Length of each equal side of an isosceles triangle is 10 cm and the included angle between those two sides is 45o. Find the area of the triangle. 14. In a triangle ABC, the base BC is trisected at D and E. The line through D, parallel to AB, meets AC at F and the line through E parallel to AC meets AB at G. Let EG and DF intersect at H. What is the ratio of the sum of the area of parallelogram AGHF and the area of the triangle DHE to the area of the triangle ABC? Ratio of areas of two similar triangles is equal to the ratio of squares of the corresponding sides. 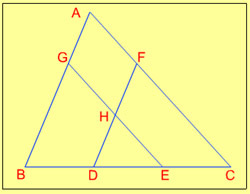 In the figure below, ABC, GBE, FDC and HDE are similar triangles. Sides of triangles GBE and FDC are 2/3 of the sides of triangle ABC. Hence if the area of the triangle ABC is assumed to be 1 sq. unit, the areas of triangles GBE and FDC would be (2/3)2 i.e. 4/9. Sum of the area of parallelogram AGHF and the area of the triangle DHE = 2/9 + 1/9 = 3/9 = 1/3. 15. 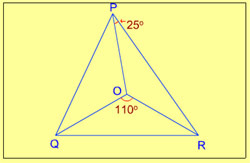 PQR is an equilateral triangle. O is the point of intersection of altitudes PL, QM and RN. 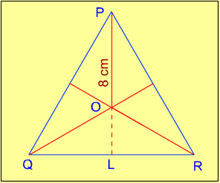 If OP = 8 cm, then what is the perimeter of the triangle PQR? Therefore each side = 24/√3 and perimeter = 72/√3 = 24√3 cm.